Practical radio frequency coils have Q's from 50 to 200 and occasionally 500. Audio frequency coils range from 1 to 10 and occasionally are as low as 1/2. The higher the Q, the better. The rate at which current dies down in a resonant circuit, after the source has been disconnected, is called the damping of the circuit, whose measure is called the decrement δ. Q = π/δ. A high Q circuit is lightly damped, has a small decrement, a sharp resonance peak, and a high selectivity. 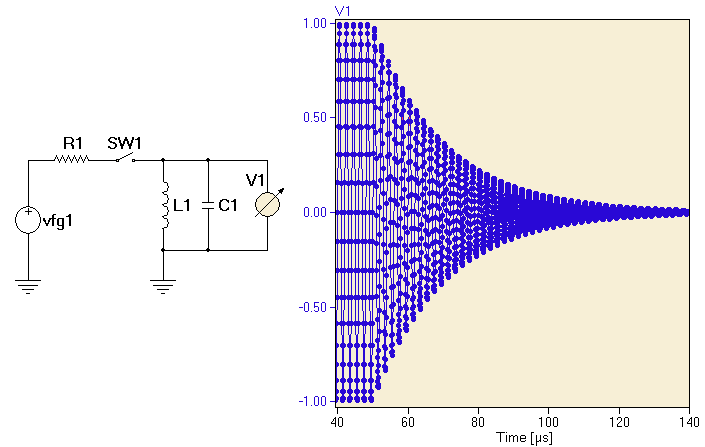 This example shows the fall-off of the resonant oscillation after switching off the source oscillator vfg1. The resonance frequency of the LC circuite is approx. 500 kHz. The switch S1 opens after 50 us.